The Canadian Seed Trade Association (CSTA) has launched its “Coexistence Plan for Alfalfa Hay,” paving the way for Forage Genetics International to sell genetically modified (GM) alfalfa in Canada. Meetings were held to develop the plan in October 2012 and July of this year, during which farmers and consumers protested outside. 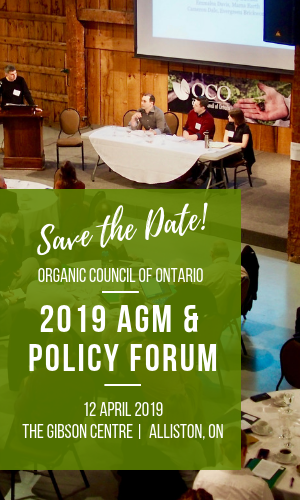 The Organic Council of Ontario (OCO) participated in the October “co-existence strategy development” meeting after which we left disappointed that not one single farmer was on hand to make the case for farmers wanting this technology. The CTSA has developed what is considers “best management practices” to “reduce” the chances of cross contamination. OCO has been strongly opposed to their adoption without first completing a promised feral alfalfa study and without proper consultation within the farm community. Forage Genetics International, the US company which holds marketing and distribution rights of Monsanto’s RRA (Round-up Ready Alfalfa), has said it would wait until a coexistence plan was published before releasing GM alfalfa on the market. The company has also stated its intention to initially only release the seeds in Eastern Canada. Alfalfa is one of the most widely grown crops in Canada and is indispensable for forage, animal feed and as a green manure cover crop. This valuable crop is of particular importance to organic farmers, who rely on it to fix nitrogen, build soil fertility, reduce erosion, increase aeration and out-compete weeds. Alfalfa is a perennial crop, pollinated by bees and other insects. If released, RRA would be the first perennial GM crop to be introduced into Canada. Despite strong opposition from the general public as well as from the farm community – including Western alfalfa seed companies, farmers from the CFFO, the NFU and the OFA, the Quebec Farmers’ Union and the Quebec Dairy Farmers – RoundUp Ready Alfalfa was registered for sale in April of this year. This immediately after, on April 9, farmers and consumers in 38 communities across Canada rallied to stop any market release of GM alfalfa. The Canadian Biotechnology Action Network and the National Farmers Union rebutted the CSTA’s “coexistence plan” in a technical paper released in July which criticized the plan as ignoring basic facts of alfalfa biology and many realities of farming. For more information on GM alfalfa and actions that can be taken, visit the Canadian Biotechnology Action Network website. Alternative Journal Article: Be warned: If Monsanto’s Roundup Ready Alfalfa is commercialized, the flow of genes and traits from GM to non-GM alfalfa will be inevitable and irreversible.